Kick off your visit on the 13th (Fri): ponder the design of Magic Fountain (Font Magica), then appreciate the history behind Casa Batllo, then walk around Parc Guell, and finally admire the landmark architecture of Basilica of the Sagrada Familia. Here are some ideas for day two: see the interesting displays at Casa Mila - La Pedrera, then examine the collection at Museo Picasso, and then take a stroll through El Barri Gòtic. Discover how to plan a Barcelona trip in just a few steps with Inspirock's itinerary builder. Perth, Australia to Barcelona is an approximately 23-hour flight. You'll gain 7 hours traveling from Perth to Barcelona due to the time zone difference. Traveling from Perth in September, expect Barcelona to be somewhat warmer, temps between 30°C and 21°C. Finish your sightseeing early on the 14th (Sat) so you can travel to Carloforte. Carloforte is a fishing and resort town of located on Isola di San Pietro, approximately 7km off the southwestern coast of Sardinia, in southern Sardinia, Italy.HistoryAccording to a legend, a local church was founded in the early 14th century in honour of hundreds of participants to the so-called Children's Crusade of 1212 who perished in a shipwreck just off the island on their way to North Africa during a gale. Get in touch with nature at La Conca and Spiaggia di Cala Fico. Relax by the water at Spiaggia di San Nicolo' and Cape Sandalo. There's still lots to do: enjoy the sand and surf at Punta Delle Colonne and stroll through Spiaggia di Girin. To see where to stay, maps, traveler tips, and tourist information, go to the Carloforte online holiday maker . Explore your travel options from Barcelona to Carloforte with the Route module. Traveling from Barcelona in September, you will find days in Carloforte are somewhat warmer (34°C), and nights are about the same (20°C). Wrap up your sightseeing on the 17th (Tue) early enough to travel to Rome. Get some cultural insight at Colosseum and Palatine Hill. There's much more to do: pause for some serene contemplation at St. Peter's Basilica, don't miss a visit to Piazza Navona, explore the world behind art at Galleria Borghese, and admire the striking features of Pantheon. To see maps, traveler tips, other places to visit, and tourist information, you can read our Rome trip itinerary builder app . Explore your travel options from Carloforte to Rome with the Route module. In September in Rome, expect temperatures between 32°C during the day and 18°C at night. Wrap up your sightseeing on the 20th (Fri) to allow time to take a train to Florence. 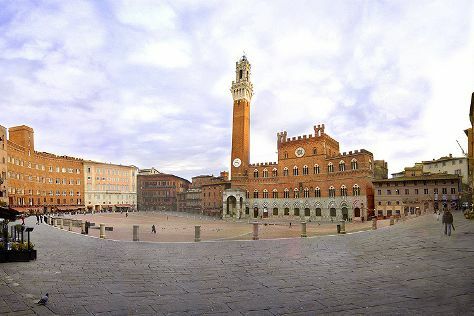 You'll explore the less-touristy side of things at Piazza del Campo and Siena Cathedral. Satisfy your inner culture vulture at Uffizi Galleries and Piazza della Signoria. Next up on the itinerary: get to know the fascinating history of Piazza del Duomo, admire the natural beauty at The Boboli Gardens, contemplate in the serene atmosphere at The Baptistery of St. John, and see the interesting displays at Academy Of Florence Art Gallery. To find ratings, more things to do, traveler tips, and tourist information, refer to the Florence trip planner . Take a train from Rome to Florence in 2 hours. Alternatively, you can drive; or fly. In September, plan for daily highs up to 30°C, and evening lows to 17°C. Finish your sightseeing early on the 23rd (Mon) so you can travel to Portoferraio. Portoferraio is a town and comune in the province of Livorno, on the edge of the eponymous harbour of the island of Elba. You'll enjoy a bit of beach vacationing at Spiaggia Luisi d'Angelo and Spiaggia di Cotoncello. Take a break from the city and head to Scuba & Snorkeling and Spiaggia di Seccione. 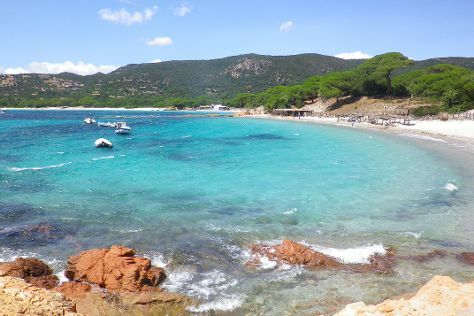 Get out of town with these interesting Portoferraio side-trips: Spiaggia delle Tombe (in Campo nell'Elba) and Spiaggia di Chiessi (in Chiessi). There's more to do: kick back and relax at Spiaggia Canata. For traveler tips, where to stay, ratings, and other tourist information, use the Portoferraio visit site . Traveling by combination of car and ferry from Florence to Portoferraio takes 3 hours. Alternatively, you can do a combination of train and ferry; or do a combination of bus, train, and ferry. In September, daily temperatures in Portoferraio can reach 28°C, while at night they dip to 19°C. Finish up your sightseeing early on the 26th (Thu) so you can travel to Paris. Eiffel Tower and Musee d'Orsay are good opportunities to explore the local culture. Step out of Paris with an excursion to Palace of Versailles in Versailles--about 48 minutes away. Next up on the itinerary: admire the masterpieces at Louvre Museum, pause for some photo ops at Arc de Triomphe, pause for some serene contemplation at Basilique du Sacre-Coeur de Montmartre, and steep yourself in history at Cathédrale Notre-Dame de Paris. 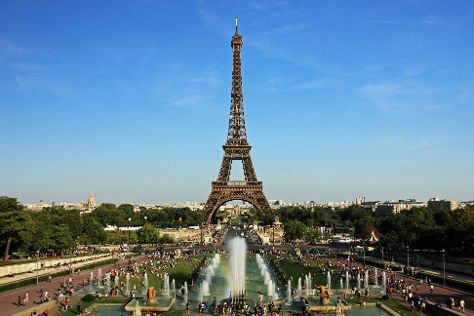 To find reviews, ratings, photos, and tourist information, use the Paris trip planner. Traveling by combination of ferry and flight from Portoferraio to Paris takes 7 hours. Alternatively, you can do a combination of ferry, bus, and flight; or do a combination of ferry, train, and flight. Traveling from Portoferraio in September, expect Paris to be slightly colder, temps between 24°C and 13°C. Wrap up your sightseeing on the 29th (Sun) early enough to travel to Porto-Vecchio. Porto-Vecchio is a commune in the Corse-du-Sud department of France on the island of Corsica. Relax by the water at Plage Porto Novo and Plage de Palombaggia. Visiting Sentier Littoral des Bruzzi and Plage de San Giovanni will get you outdoors. Step out of Porto-Vecchio to go to Bonifacio and see Cimetiere Marin de Bonifacio, which is approximately 40 minutes away. Next up on the itinerary: kick back and relax at Plage de Tramulimacchia, tour the pleasant surroundings at Tamaricciu Beach, and get some thrills out on the water with a waterskiing or jet-skiing adventure. To find ratings, reviews, where to stay, and tourist information, use the Porto-Vecchio trip itinerary planner . You can fly from Paris to Porto-Vecchio in 5 hours. Other options are to do a combination of flight and bus; or do a combination of train, ferry, and car. Prepare for a bit warmer weather when traveling from Paris in September: high temperatures in Porto-Vecchio hover around 31°C and lows are around 18°C. Wrap up your sightseeing on the 2nd (Wed) early enough to travel to Naxos. Relax by the water at Maragas Beach and Alyko Beach. 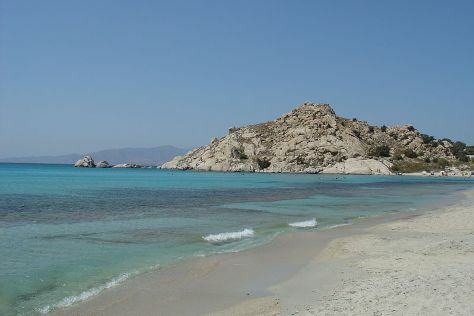 Visiting Agiassos Beach and Mikri Vigla Beach will get you outdoors. And it doesn't end there: kick back and relax at Kastraki Beach, take a stroll through Old Town, explore the ancient world of Portara, and see the interesting displays at Eggares Olive Press Museum. To find more things to do, reviews, and more tourist information, refer to the Naxos trip builder tool . Getting from Porto-Vecchio to Naxos by flight takes about 9.5 hours. Other options: do a combination of bus and flight. Traveling from Porto-Vecchio to Naxos, you'll lose 1 hour due to the time zone difference. Traveling from Porto-Vecchio in October, you can expect nighttime temperatures to be somewhat warmer in Naxos, with lows of 20°C. Wrap up your sightseeing on the 5th (Sat) early enough to travel to Plakias. We've included these beaches for you: Episkopi Beach and Skinaria Beach. You'll discover tucked-away gems like Glika Nera Beach and Plakias Beach. Venture out of the city with trips to Frangokastello Beach (in Frangokastello), Kalyves Beach (in Kalyves) and Historical & Folklore Museum of Gavalochori (in Gavalochori). For reviews, maps, and other tourist information, use the Plakias attractions planner . Ride a ferry from Naxos to Plakias in 5 hours. Alternatively, you can do a combination of ferry and taxi; or do a combination of flight and shuttle. In October, daytime highs in Plakias are 28°C, while nighttime lows are 19°C. Cap off your sightseeing on the 9th (Wed) early enough to travel back home.